Monday of Holy Week, April 15th – Service at 12:10 p.m. All are welcome. Tuesday of Holy Week, April 16th – Service at 5:30 p.m. All are welcome. Wednesday Of Holy Week, April 17th – Service at 5:30 p.m. All are welcome. Maundy Thursday, April 18th – Service at 5:30 p.m. We will begin in the Parish Hall. The Watch begins in the Chapel following the end of the service. All are welcome. Good Friday, April 19th – Good Friday Liturgy will start at 1:00 p.m. The Loose Offering will go to the Church in Jerusalem. All are welcome. Holy Saturday, April 20th – Service starts at 9:30 a.m. in the Chapel, followed by readying the church for Easter Morning. All are welcome. Easter Sunday, April 21st – The day will begin at 6:00 a.m., with the lighting of the new fire. Following that, the vigil will begin, with appropriate readings. The new fire and readings are a preparation for what we do later in the morning at 9:30 a.m., when we renew our Baptismal covenant and Celebrate the Eucharist. Following the Eucharist, Fr. David and Marilyn invite everyone to stay for an Easter brunch in the Parish Hall. This is their opportunity to thank everyone for their friendship and love and to extend the joy of Easter morning around another meal. All are welcome. Sunday, April 28th – Eucharist at 9:30 a.m., followed by Coffee Hour and Fellowship in the Parish Hall. All are welcome. Sunday, May 5th – Eucharist at 9:30 a.m., followed by Coffee Hour and Fellowship in the Parish Hall. All are welcome. Wednesday, May 8th – Eucharist, 5:30 p.m., followed by a potluck and Study. All are welcome. 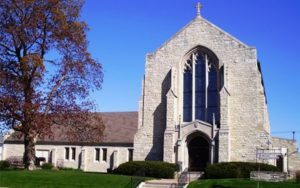 Sunday, May 12th – Eucharist at 9:30 a.m., followed by Coffee Hour and Fellowship in the Parish Hall. All are welcome. Wednesday, May 15th – Eucharist, 5:30 p.m., followed by a potluck and Study. All are welcome. Sunday, May 19th – Eucharist at 9:30 a.m., followed by Coffee Hour and Fellowship in the Parish Hall. All are welcome. Sunday, May 26th – Eucharist at 9:30 a.m., followed by Coffee Hour and Fellowship in the Parish Hall. All are welcome. Sunday, June 2nd – Eucharist at 9:30 a.m., followed by Coffee Hour and Fellowship in the Parish Hall. All are welcome. Wednesday, June 5th – Eucharist, 5:30 p.m., followed by a potluck and Study. All are welcome. Sunday, June 9th – Eucharist at 9:30 a.m., followed by Coffee Hour and Fellowship in the Parish Hall. All are welcome. Sunday, June 16th – Eucharist at 9:30 a.m., followed by Coffee Hour and Fellowship in the Parish Hall. All are welcome. Wednesday, June 19th – Eucharist, 5:30 p.m., followed by a potluck and Study. All are welcome. Sunday, June 23rd – Eucharist at 9:30 a.m., followed by Coffee Hour and Fellowship in the Parish Hall. All are welcome. Wednesday, June 26th – Eucharist, 5:30 p.m., followed by a potluck and Study. All are welcome. Sunday, June 30th – Eucharist at 9:30 a.m., followed by Coffee Hour and Fellowship in the Parish Hall. All are welcome.